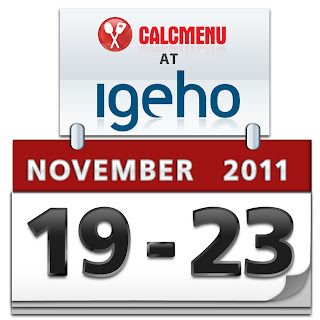 CALCMENU will be participating in Igeho, the most important international trade show for hotel and catering industry in Switzerland. Igeho will be held in Basel, Switzerland on November 19-23, 2011. Over 800 exhibitors in different fields such as Food & Drink; Kitchen technology & Cleaning; Delicatessen & Wines; and Restaurant & Hotel Requisites will gather together in Basel for five days. CALCMENU will join top executives and specialists from the hotel and catering industry in Igeho to give you a sneak peek of its newest and the latest offering to the foodservice industry. Watch out for more details about this exciting new solution from CALCMENU!